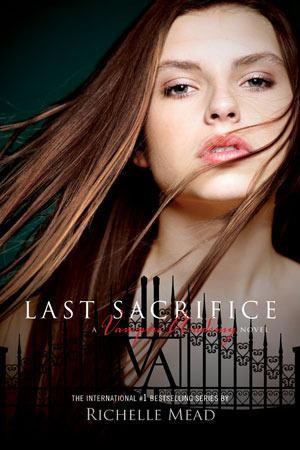 Last Sacrifice by Richelle Mead is the final book in her Vampire Academy series. Rose Hathaway has always played by her own rules. She broke the law when she ran away from St. Vladmir's Academy with her best friend and last surviving Dragomir princess, Lissa. She broke the law when she fell in love with her gorgeous, off-limits instructor, Dimitri. And she dared to defy Queen Tatiana, leader of the Moroi world, risking her life and reputation to protect generations of dhampir guardians to come. Now the law has finally caught up with Rose- for a crime she didn't even commit. She's in prison for the highest offense imaginable: the assassination of a monarch. She'll need help from both Dimitri and Adrian to find the one living person who can stall her execution and force the Moroi elite to acknowledge a shocking new candidate for the royal throne: Vasilisa Dragomir. But the Clock on Rose's life is running out. Rose knows in her heart the world of the dead wants her back.. and this time she is truly out of second chances. The big question is, when your whole life is about saving others, who will you save? 1. Mead keeps the action going in this book. Between Rose and Dimitri's escape from Court and their quest to find Lissa sibling, and Lissa, Adrian, and Christian at Court working on who murder Titiana and set Rose up to take the fall. There is rarely a dull moment in this book. 2. Loved seeing Dimitri slowly become his old self again. It is amazing to watch his transformation for being so guilt ridden about his time as Stragoi to learning to appreciate beauty again, and letting his feeling return to him. 3. Liked the way that Rose sorted out her feelings for Dimitri and Adrian. I felt she really has progressed in maturity through the books, and was able to see what she really needed out of a relationship. 4. Finally having finished this series, makes me understand the characters so much more in Bloodlines and the events that lead up to the start of that series. I would definitely read this series first and then start Bloodline, don't be like me and do it backwards. 5. Oh, and wow, Tatiana's murder came as quite the shock to me. Great job with that reveal Mead, I did not see that coming.